The Samsung Galaxy Note 9 just launched a couple of days ago with some stunning specifications. It features the latest firmware update from Samsung Experience 9.5 based on Android 8.1 Oreo. The device certainly be amongst the first few devices to receive Android 9 Pie based on Samsung Experience 10. Note 9 has now been launched and we already have the system dump available. Here are the extracted Note 9 APK files for all Samsung devices running stock firmware. The apps include the new TouchWiz Home, Galaxy Apps, Samsung Music, Samsung Themes, Bixby 2.0, Edge Panels, Samsung Keyboard, and much more. However, the following apps will only work on stock Samsung firmware based on Android 7.0 Nougat or later like 8.0 Oreo. We already have the Samsung Note 9 stock wallpapers in QHD. How to install Galaxy Note 9 Stock Apps on any Samsung device? In order to install the Samsung Galaxy Note 9 apps and features, you will need to replace the original apps with the new ones and give proper permissions for each app. Note: These apps need to be placed in the root directory. Hence, you may need a rooted Android phone. You will need to access the system folder. ES File Explorer does a very good job in it. However, having rooted Samsung Galaxy device on Android 7 Nougat or 8 Oreo would make things a little easier. Note 2: At this moment, there are two apps that crash including Device Maintenance Crashes, and Phone And Contacts Crashes. So we recommend staying away from these apps. Steps: Here for instance, we are going to use the TouchWiz Home as a reference. Repeat for each app. Download Note 9 apps packages, extract to PC and copy the new TouchWiz Home app to phone storage. Open a file manager or an app like ES File Explorer that gives you access to system apps. If you have a rooted Android device, use a root browser. Launch the file manager. Provide proper permissions. In ES File Explorer, go to the main storage screen (Local) or SD Card section. You would be at location / > storage > emulated. On the top breadcrumbs bar swipe right to get to the “/”. Find “system” folder inside and enter. There will be many folders. Our main folders are “app” and “priv-apps”. Find the app in the system folder. Here, go to system/priv-app/TouchWizHome folder. Backup the original APK file you see in there. Meaning, create a copy of the original app before you replace it. Once done, delete the original app and paste the new TouchWizHome_2017.APK file in it. This is important! Give correct permissions or else the app won’t work. To do so, hold onto the app and go to properties of the app and set Permission ‘rw-xr-xr-x’ for the folders and ‘rw-r-r ‘ (0644) for APK files. Repeat for the entire folder or each app. 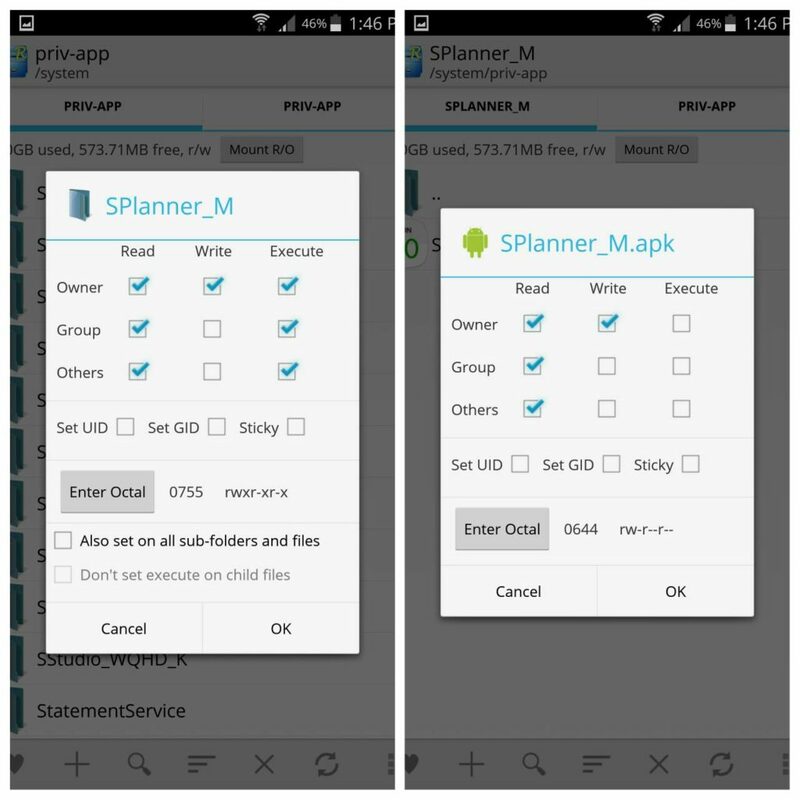 For correct permissions refer to this image – How to port S7 apps to S6. Thanks to Albe96 for these wonderful apps.